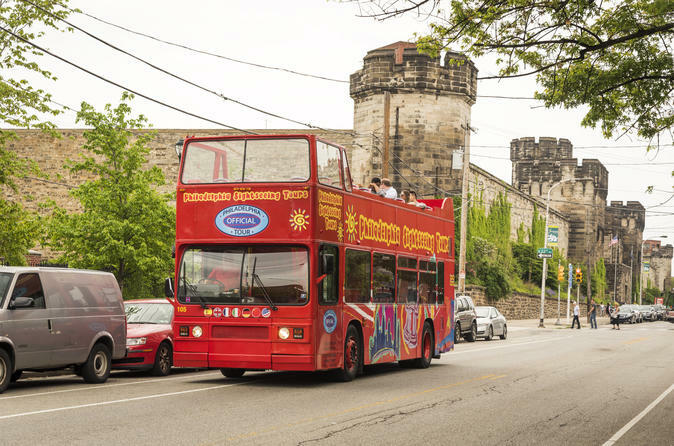 This two day hop-on hop-off sightseeing tour lets you experience the rich history and legendary sights of Philadelphia with ease and includes an admission ticket to Philadelphia's notorious Eastern State Penitentiary. Expert local guides offer live commentary as you travel a 1.5-hour loop to 27 different stops highlighting Philadelphia's 100 most popular attractions, including the Liberty Bell, Independence Hall and the US Mint. Aboard the double-decker bus, a 360-degree view of Philadelphia will leave you speechless and entertained while you soak up the history, heritage and beauty of one of America's oldest cities. Board the open-top, double-decker bus (covered trolley in the winter and inclement weather) at any of the 27 stops to start your hop-on hop-off tour of Philadelphia. Covering 16 miles (26 km), the full loop takes 1.5 hours, with live commentary on board, and provides access to 100 of the city's most popular attractions and landmarks. Travel at your leisure with this 2-day pass that allows you to explore the city with the added value of transportation throughout downtown Philadelphia. Included with your pass is an admission ticket to the notorious Eastern State Penitentiary. Plan to spend approximately two hours touring this former prison.